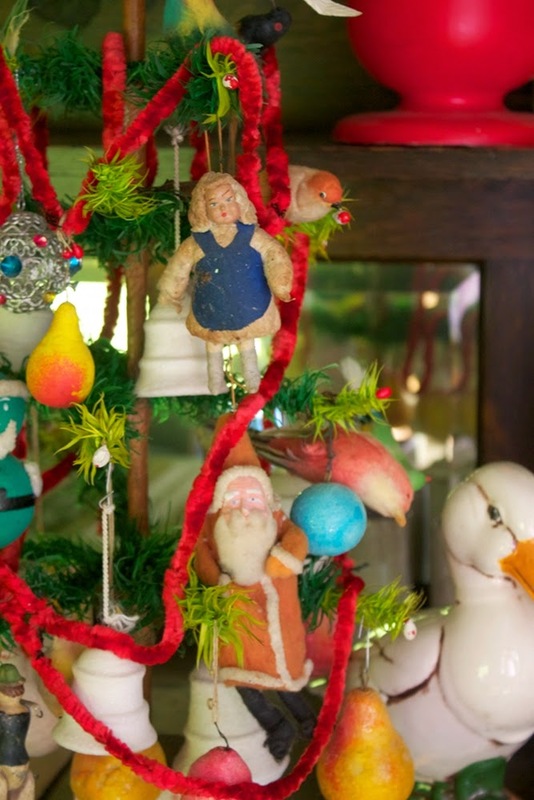 Just a tad late for Christmas but here are three feather trees that are decorated with vintage and antique ornaments. I have them on display on the buffet. We have usually put the village there but it is taking a rest this year. This 2' tall feather tree I picked up for $2.00 at a Saint Vincent de Paul thrift shop years ago. I almost didn't buy it for not recognizing how old it was. Its branches were loosely crushed up against the trunk, then wrapped with cheap decorations. After paying for it, removing all of the cheap decorations, and straightening the branches I realized that I had a 1920's feather tree. 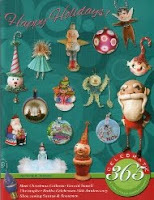 It has been decorated with vintage and antique cotton batting ornaments for the most part. The green Santa was given to me by Robin, our oldest boy, when he was very young. The little girl and the metal ball are Victorian. I'm not certain how old the chenille roping is. I saw this Victorian wooden ornament that was made in Germany in a book about Christmas decorations and fell in love with it. A few years later I came across one at a flea market in Victoria. I bought it immediately! 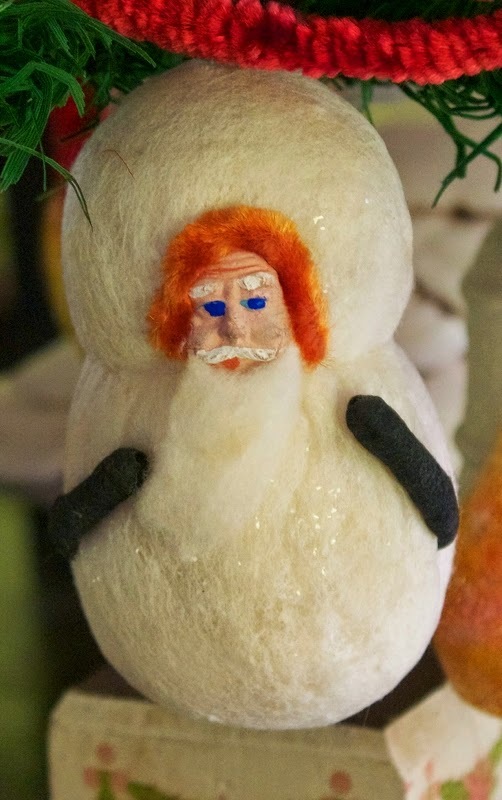 This is the snowman Santa that was behind the wooden ornament above. Here is one of the feather trees that I made years ago. 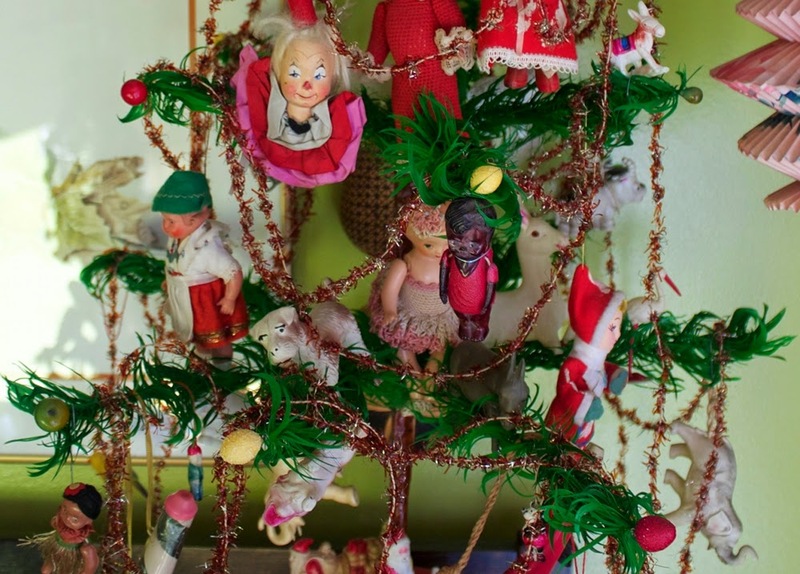 Most of the ornaments on the tree and below it are celluloid. The large red curved item is a hunting horn/party horn. Both this horn and the pink, white, and green horn still work. The large swan is a celluloid bath toy. The clown head at the top is not made of celluloid, neither is the little girl in the snow suit. The clown is Italian. The garland is very tatty isn't it, I love it though. 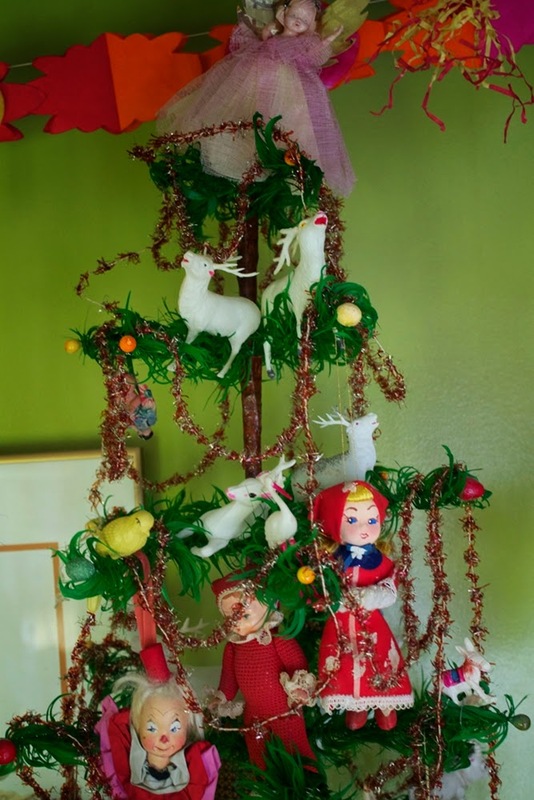 It is made of metal tinsel and finely cut cellophane. I have not come across it since purchasing these two garlands. It is less than 1/2" wide. The little girl in the red coat was bought at the same time as the girl in the snow suit. I think that they may be from the early 1960's. 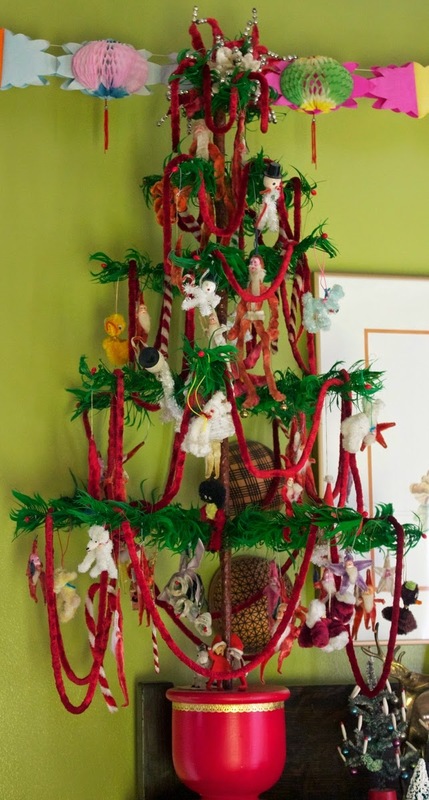 There are lots of celluloid animals on the tree. 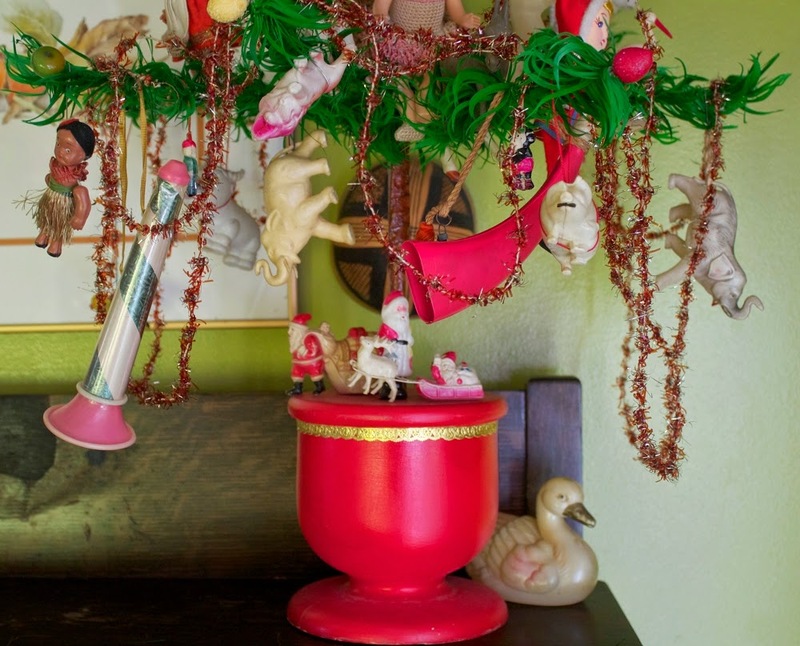 The angel, or if you are British, the Christmas Fairy, is made of hard plastic dressed in tarletan. Tarletan is similar to cheesecloth in the weave but is stiffened and came in a variety of colours. I have some folds of it from 1910, one with a beautiful chromolithograph on it of a costume that could be made using the tarletan and inexpensive fabric or crepe papier. 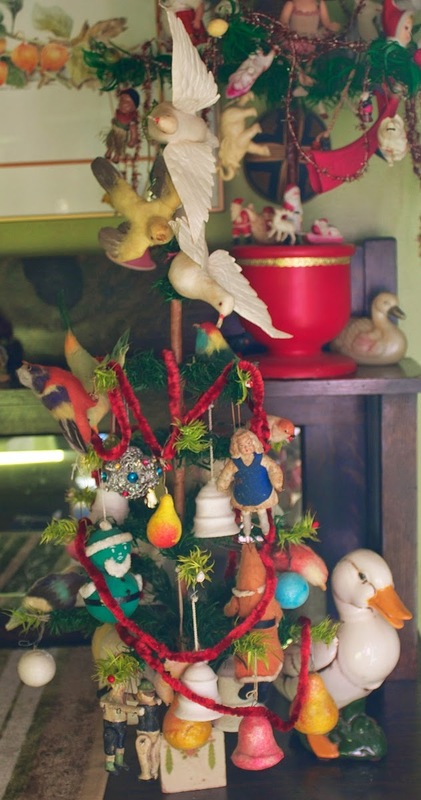 The other feather tree that I made several years ago is decorated with a selection of chenille ornaments. 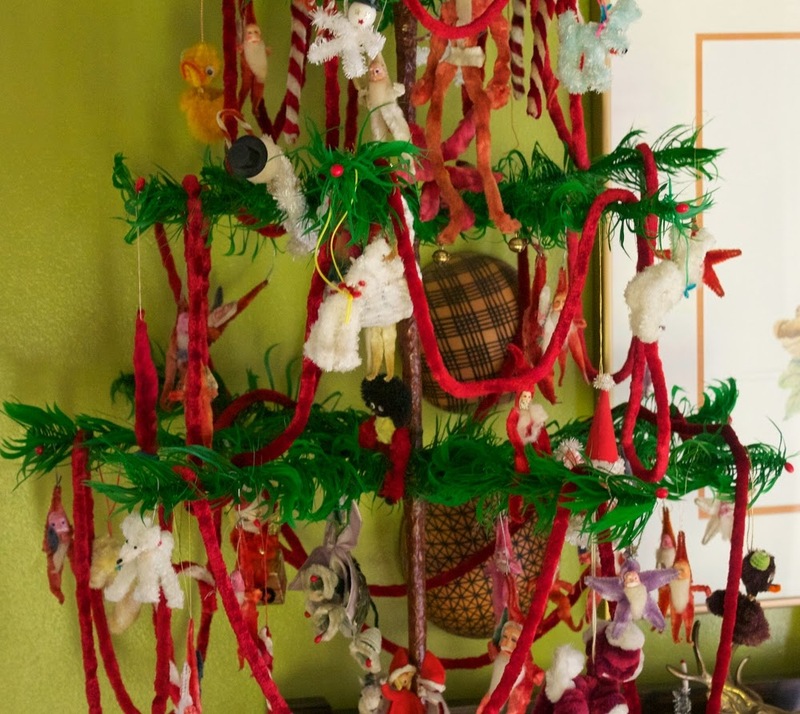 Lots of chenille Santas, candy canes, and animals decorate this tree. 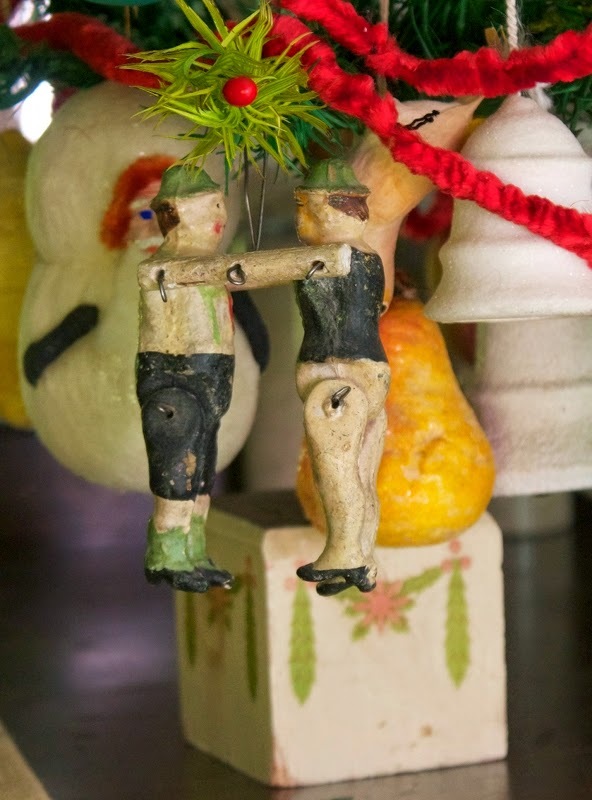 The Santa at the bottom is about 8" long with bells on his feet. There is another one close to the top of the tree beside the trunk. 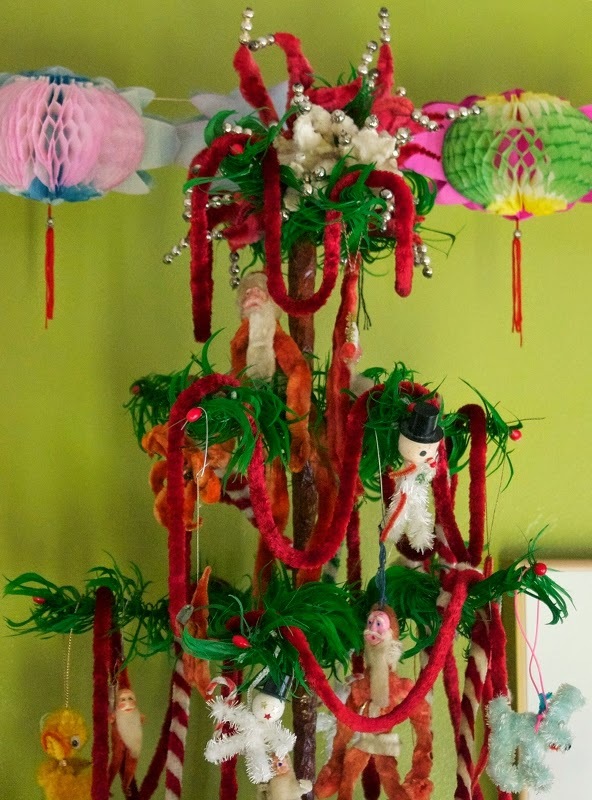 The tree topper is made of two flower shapes made of silk bump chenille that are tipped with glass beads I put them together to create one large full star-like tree topper. I hope everyone is still enjoying the holidays such as they are after Christmas. It is on to New Year's Eve.